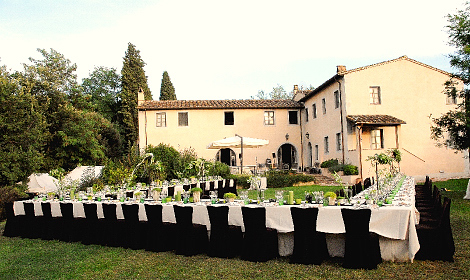 The ceremony will be hosted in the garden of this unique luxury villa located 1 hour from Florence and about 30 minutes from Pisa. The villa has been restored with comforts of a luxury hotel. It can accommodates 15 people. Heated 12 m. X 6 m. swimming pool, air-conditioning, Bose iPod-docking station, satellite TV and video player, Laptop with Internet wireless service in the house. Coordination, planning and staging of the wedding, professional wedding planner that will assist you trough all the process from planning, finding vendors and follow the ceremony and dining reception.